Cupuacu and Manketti nut oils deeply moisturize the driest most damaged hair. Nourishes hair after bleaching, highlighting and straightening. Gives immediate and long-lasting softness, shine and easy styling. 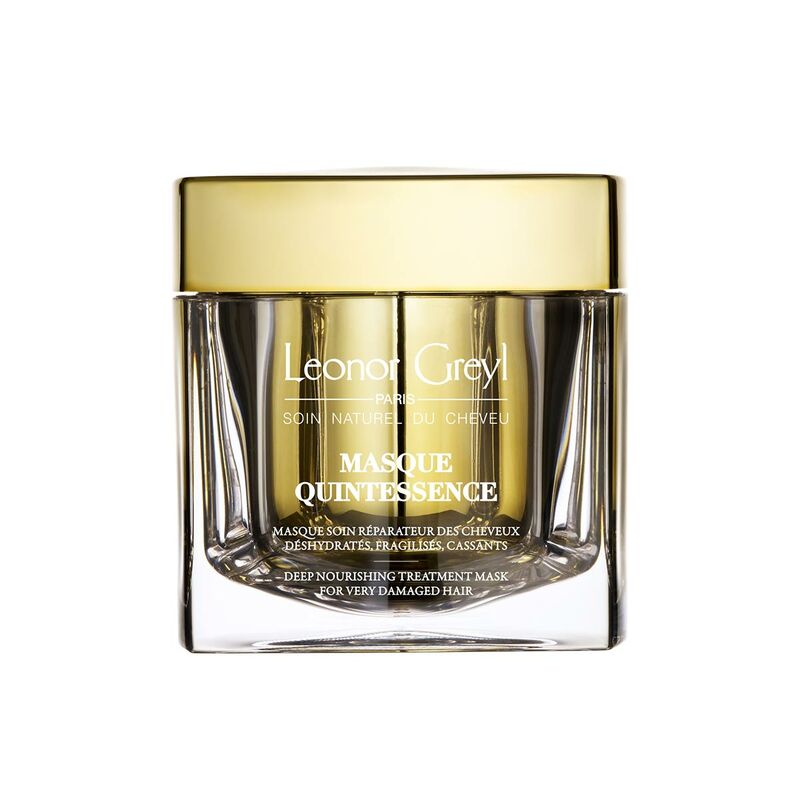 Leonor Greyl’s Masque Quintessence is the beauty treat of a lifetime! Taking care of yourself from the smile on your face to the health of your hair, this masque does it all! This is a true miracle product! If your hair is damaged by over-processing, over-drying, over whatever-ing, you need this! Apply to ends first, then hair shaft. I put a shower cap on and leave it on overnight. In the morning, rinse out. You will have a new head of hair. It is that good. Pricey? Yes. But the product lasts a long time and is totally worth it! Treat yourself. This mask is worth it. Goes a long way. I love it. I prefer all the other Lenor Greyl masks to this one. It just didn’t do it for me like the other masks. This is the most wonderful masque I have tried! The scent is amazing. The richness of the creamy product just absorbs and puts moisture into dry and damaged hair. I love the shampoo as well. This masque is 5 stars. I have used many of Leonore Greyl products and they are some of the best hair products on the market. I am so grateful they are available in the U.S. as I normally purchase them in France. this mask i the most innefective product that I´ve ever tried. It provided absolutely no moisture, made my hair so tangled and as I was rinsing it out so much of my hair fell out. I am so so disappointed and I cannot believe I spent so much money on it. I’m sorry to hear about your experience, we will be reaching out to you directly today to discuss this issue in more detail. This masque is simply perfect. I naturally have very dry and course hair…and on top of that I get blonde highlights. I have never found a hair masque that provides immediate results like this masque does. Or really even a hair masque that provides any results at all. Most masques make my hair feel slippery when on, but then after the shower I feel like my hair shows no benefit. After the first use of Masque Quintessence, my hair was smoother, softer, and healthier. And it’s a double bonus that the ingredients are all natural. This masque completely transformed my hair! I found out about it in an article about the best conditioners for dry hair and decided to take a chance get it for myself as a birthday present. It was the best gift I ever received! I used it as a deep treatment on dry hair for the first two weeks and the results were amazing. My hair was silky all the way to the ends and I was able to skip the salon conditioning treatment at my next visit. I meant to use this only once in a while and thought using it as a daily conditioner was crazy given the cost, but it works so well and smells so good I couldn’t resist using it every time I shampoo (about 3 times per week). I found that you only need a small amount on damp hair and it even comes with a little spoon to scoop out the exact amount you need. I have very long, fine hair and I’m still working on the jar I bought 3 months ago. If any one has told you that the only cure for your dry hair is to cut it all off and start over, don’t believe them! Try this first! Now, nothing but LG products touch my hair. I also recommend going with a full treatment collection. You really don’t know how fabulous your hair can be until you switch to LG! The Masque Quintessence is a very rich and moisturizing product. It helped my curly, dry hair to feel and look softer and a bit more shiny. Extremely restoring for very damaged hair, make them shiny and healthy, nice to touch and enhance their nature in color and consistency. Excellent value for money. Optimal for all seasons. Definitely a must have. Thank you for reaching out to us. We do offer Luxury Sample Sets on our website, which allow you to try multiple products for minimal cost. Some of our authorized partners do also have samples in stock, but I would check with them first. Thank you! I received a sample of this and absolutely love it. It made my hair so smooth, shiny and strong. Leonor Greyl products are expensive, but are the ONLY products out there that are worth it, in my opinion. And I’ve tried everything! There is NOTHING that can restore my frizzy, coarse, curly Italian hair like this product. Leave it in overnight and have soft, healthy hair in the morning! my best, this is the one. I absolutely love this product and so does my hair. I have color treated and super fine which needs a little more love and attention during the summer months. You apply this product Before shampooing so it doesnt cause your hair to be weighed down . However, because my hair is so fine I only use it once a week or sometimes once every two weeks. Try it! You wont be disappointed. Masque Quintessence is I know it’s pricey, but well worth every penny (in my opinion). My hair is really dry and pretty damaged from styling and processing, but this conditioner totally transforms it. I use it on my hair dry and let it sit for a while before I jump in the shower. The results are amazing. I highly recommend biting the bullet on the price and trying this masque. You won’t regret it! If you have healthy, shiny or young hair or hair that can be shiny with a little shine serum, you might want to pass on this mask. It simply isn’t going to do as much for your hair for the price. BUT if you have hair that is thinning with age, or has lost luster, volume and shine from color treatment or age, this will be worth EVERY penny. This mask wil replace moisture and really change the texture of seriously dry hair after one application. It also imparts shine and I think it also moisturizes a dry scalp really well. It doesn’t leave hair greasy or limp. Surprisingly, there’s a lot of bounce and volume after using this, which usually doesn’t happen after a mask treatment. The scent is a bit strong, as is all Leonor Greyl products, but I think it’s pleasant and not too overpowering. Tip: I’ve left this on for just five minutes and had the same results as leaving it on 20 minutes. Masque Quintessence is a Summer must have. I know it’s pricey, but well worth every penny (in my opinion). My hair is really dry and pretty damaged from styling and processing, but this conditioner totally transforms it. I actually use it on my dry hair (as they suggest), let it sit for a while, and then jump in the shower. The results are awesome. I highly recommend biting the bullet on the price and trying this masque. You won’t regret it! I absolutely love Masque Quintessence and so does my hair. I have color treated and super fine which needs a little more love and attention during the summer months. You apply this product before shampooing so it doesn’t cause your hair to be weighed down. However, because my hair is so fine I only use it once a week or sometimes once every two weeks. Try it! You won’t be disappointed. After many color changes, my hair was damaged almost beyond repair and I was contemplating cutting off about 4 inches. Even though a friend recommended this product, I was hesitant because of the price. I convinced her to let me use some of hers and then I realized why it is so worth the money! I immediately noticed a difference, especially on the ends, and now I use it every week to keep my hair looking healthy. My new stylist said this product can’t be beat for damaged hair – I totally agree. Believe me, my hair was in the worst shape from a really bad bleach job and I didn’t know how to fix it. This conditioner made all the difference in the world. I absolutely love the Leonor Greyl luxury hair care line! My favorite this winter is the Masque Quintessence. My relaxed hair was becoming lifeless from the constant abuse of the cold. This conditioning Masque Quintessence treatment combined with the Huile de Palme, has left my hair moisture rich and full of body, even in the midst of these snowy storms. As a weekly intensive treatment, apply to dry length and ends, and leave on for up to 20 minutes. Then, wet hair and detangle with a wide-tooth comb, shampoo and rinse well. For optimal results, apply Huile de Leonor Greyl first, and layer Masque Quintessence directly on top. This luxurious product was originally designed to nourish the driest and most dehydrated hair with the most replenishing mask available. Created in 2008, this nourishing nectar soothes and smooths following all types of aggressive processing (bleaching, highlighting, straightening, perming, etc.) and revitalizes even the most damaged hair. Inspired by the Institute’s treatments, where staff blend different products to concoct the most restorative formula possible, Tom Brooks was able to show the brand’s expertise off to perfection with this exceptional mask.